Mohd Sujathullah is pursuing Pharm D from Sultan Ul Uloom College of Pharmacy, Hyderabad, India. His father, Mohammed Sibghatullah Subhani, is a retired school teacher. His parents instilled in him the value of human life from an early age. Living in a joint family, he realized the importance of helping one another. During the early years of his life, he felt the need to serve the poor and needy. 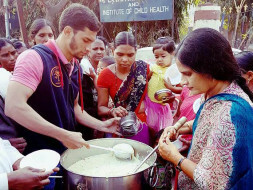 His urge to serve the hungry started in the year 2016 when he fed the poor with his pocket money. He first fed them Rice and Curry near Secunderabad Railway Station. When the poor and hungry saw food in his hands, they rushed towards him to satisfy their hunger. He felt immense satisfaction and humility after this experience. People living with comforts hardly realize the pain and suffering of the hungry. However, we observe many people living around us not having sufficient food to lead a healthy life, which is the basic right of an individual being a human. The second project is serving breakfast at Nilofer Children’s hospital. After seeing the success of food distribution at night, he wanted to do something more effective. He consulted people and one of them suggested to start feeding breakfast. After doing a survey of many places, Nilofer Hospital was zeroed in for various reasons. The primary reason for this was the fact that this is a children’s hospital where people visit from distant places, regions in and around Telangana. Treatment in this hospital is provided free of cost. My Self Mohd Sujathullah President Humanity First Foundation. Since 400 Days We do Daily Free Breakfast Distribution Progamme for 700 Poor Needy patients outside Nilofer hospital Hyderabad. Since 3 Years we do dinner Distribution Programme for poor needy street sleeprs. We thank our donors for their gracious support to our charity program. We work to feed our fellow brethren irrespective of their caste, creed or religion. Every single Rupee donated is utilized in the most appropriate manner to the utmost deserving persons. Our campaign is designed to feed the maximum persons in a daily budget. We request you to spread the word to your family and friends to support our work. Any person living in Hyderabad can visit us at Koti Maternity Hospital at 8am and Nilofer Hospital, Lakdi-ka-pul at 8.30am, NIMS HOSPITAL. Daily budget 5000rs for 1000 People. 4200rs for 30kg rawa upma which is prepared in pure ghee with chatni. 500rs for transportation 3 Places. Thank you all for making this campaign this successful! I have started providing food to NIMS hospital in Hyderabad for 200-300 more people. Hence I am increasing the goal amount to Rs.20,00,000. Keep supporting and spreading the love! I Firstly want to thank everyone for your continous support and prayers. We always try harder to target places where we can reach a large number of crowd and feed the people in need. And so....I have another GOOD NEWS to share. As you all know we were serving at koti maternity and Niloufer Hospital earlier but now we have also started serving Free breakfast at NIMS hospital And its totally a great satisfaction. We are now serving more than 1000 people breakfast daily. HFF has been so far delivering this service for nearly 850 people every morning for 2 years now and now the count has RISEN to more than 1000 daily. Per Day Cost 5000rs For nearly 1000 People in total 3 Places. Koti Maternity Hospital Nilofer Hospital NIMS Hospital. We are striving harder and harder to fulfill our dream of eradicating hunger. Serving the needy is such a peace. I sincerely thank all my donors, my supporters, my family and friends. Please keep supporting us. I really hope we all continue to work and strive together to fight against hunger and serve humanity. We take nothing from this world but good deeds. Humanity first foundation strongly beleives in this! I hope this helps. Om Sai Ram.